A new kitchen concept that uses a natural teak finish for the base cabinet doors with a glossy shade for wall cabinet doors. This kitchen concept uses dual concept for some serious creativity. 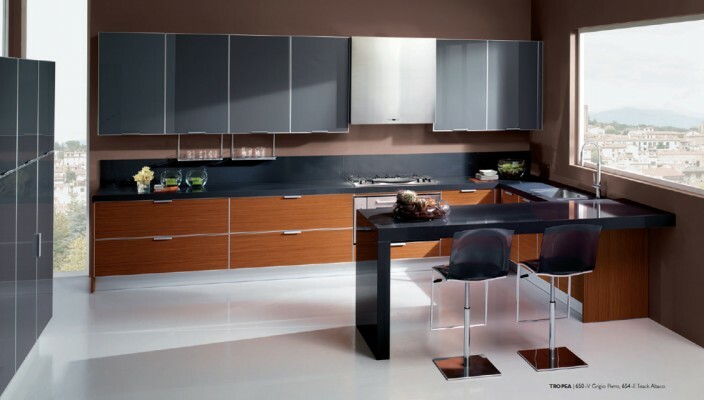 The base cabinets have doors in a natural wood finish, while the wall cabinets come in a dark finish in a glossy style. The handles are added from outside to add a little of detailing, and countertops are designed in a black finish to add some drama to the teak finish of the base cabinets. With use of two walls, one of the walls has been left free to allow natural light.